I’m sitting on a narrow wooden bench, under a burning hot aluminum roof, next to a mother with a small boy on her lap who keeps a wary eye on me. I’ve come to this rural village on the coast of Liberia to learn more about a CI-GEF project, co-led by colleagues in CI-Liberia and the Liberian Environment Protection Agency, that seeks to conserve and protect mangrove forests. The project is a year into implementation and negotiations with this community, and several others, are nearly complete to jointly agree on conservation actions and corresponding benefits that will encourage mangrove forest management. This approach to community-level conservation, called Conservation Agreements, is not new in Liberia and have shown success in providing real alternatives to resource restrictions. The CI-GEF mangrove project employs Conservation Agreements with several communities, in addition to developing participatory land-use plans and establishing protected areas to protect at least 35% of Liberia’s mangroves. In addition to shoreline protection and carbon sequestration, these mangrove forests provide important nursery grounds for fish and are home to crabs and shrimp. But in some areas, these forests are under threat from unsustainable harvest for fuelwood and charcoal production, clearing for building construction, and unregulated fishing. In this, and other communities we’ll visit on this trip, women buy, process and market the fish that men catch. Located far from markets, this usually involves smoking the fish so that they can be stored or transported by motorcycle over bumpy dirt roads. This smoking process requires fuelwood, and mangrove trees provide a readily-available source of slow-burning wood. It is clear that any initiative that seeks to conserve and protect mangrove forests must fully understand and integrate this critical need – both for global environmental benefits and human wellbeing. The GEF’s policy on gender mainstreaming helps to ensure this happens, and has propelled projects such as this one to proactively and systematically understand and address gendered uses and needs of natural resources. What a gender-mainstreamed project looks like depends greatly on the environmental context and the local cultural norms and responsibilities of women and men. 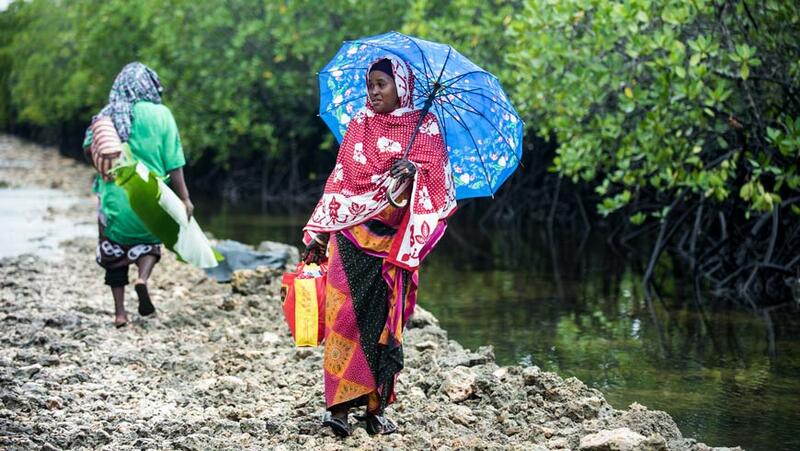 In this case, the women have identified ‘eco-stoves’ as one solution to reduce their need for mangroves. These mud structures will be more fuel-efficient, concentrating the small wood fires to slow dry fish. At the same time, the fishers of the community – all men – have identified large-eyed, deep sea fishing nets as a solution to reduce their reliance on mangrove fisheries; this will also result in bigger, more profitable fish for the women to dry and sell. With billions of dollars directed towards global environmental benefits, the GEF needs policies such as the newly adopted - more robust and ambitious – policy on gender equality, that can ensure that these benefits are directed to those who need them most.